A 24-year-old driver from Roxbury was killed after rear-ending a Massachusetts Bay Transportation Authority (MTBA) bus at a bus stop, reports CBS Boston. The accident happened on Route 28. On the bus, there were nine people who were sent to the hospital with injuries, most complaining of back pain. According to the spokesperson of the MBTA, the bus was legally stopped at its bus stop when the accident happened. Our MBTA accident lawyers understand that bus stops and other mass transit hazards are scattered throughout the city, and safety navigation around them can be tricky at times. According to the Federal Motor Carrier Safety Administration (FMCSA), there were more than 10,000 injury bus accidents recorded in the U.S. in 2008. Roughly 11,000 vehicles were involved and close to 25,000 passengers injured. Trucks, buses and RVs can pose special hazards, because they are significantly larger and heavier than other vehicles. While bus and truck drivers are experienced professional operators, other drivers may not recognize the importance of special considerations in sharing roads with these large vehicles. While many cases are the fault of the bus driver, in some cases the auto driver isn’t paying attention to the bus driver’s blind spots. Keep your passengers safe when driving around large trucks and buses; be extra-cautious. Sharing the road with these large vehicles can be dangerous if you are not aware of their limitations. Make sure you give them plenty of room: Buses are not oftentimes able to easily maneuver quickly. These drivers are trained to leave plenty of room around the truck or bus. Passenger vehicle drivers oftentimes see this room as space to make a lane change, but you don’t want to do it. Avoid cutting in front of a bus. 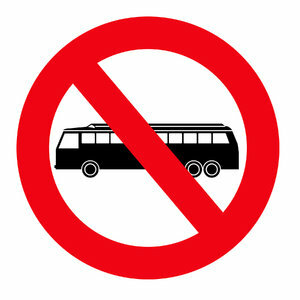 Keep off their tail end: You don’t want to tailgate a bus. In these cases, the driver probably can’t see you. You’re also not able to see the road in front of them. Always allow yourself plenty of room when following so you have plenty of time to react to a potential danger. Drive the speed limit and be alert, especially near bus stops: Passengers rushing to meet the bus may dart out into the road unexpectedly. Be patient: Try to understand that safety is the most important concern for any bus driver. Take a deep breath, consider the passengers on the bus and try to avoid anger or frustration that can lead to poor driving. Follow the rules: It is very important to pay attention and follow all traffic rules when driving around buses. All buses have flashing lights to alert you of a change in traffic pattern or to signal a stop. Pay attention. These tips are very important for those who live in the busier areas. Practice the utmost caution near buses and bus stops to help to protect yourself, you passengers and the commuters.